Sign Up Here To Access A free Course on Clarity For Your Vision, Job Hunting or Launching Your Dream Business! + Weekly Inspiration Notes For Your Success! 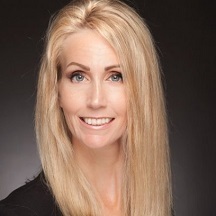 “Ashley Stahl is a very gifted and resourceful business woman and coach. 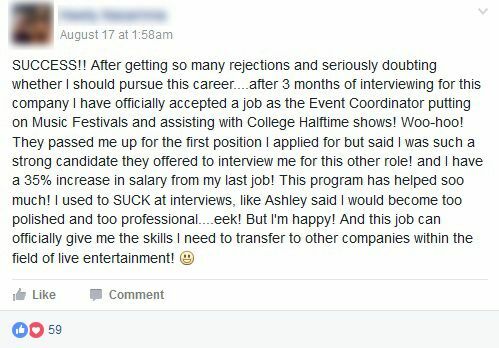 I have watched her over the past 5 years network and position herself to exactly where she wanted to be. She is driven and purposeful; I would recommend her to anyone without reservation! I have 30 years of work experience and was having a difficult time expressing my talents effectively on my resume. 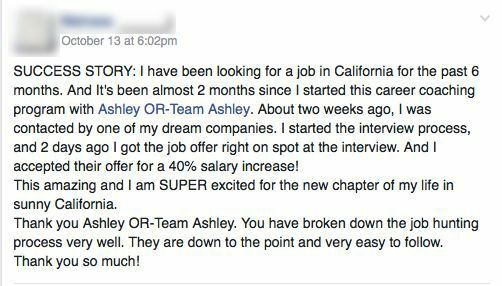 Ashley was able to take the information I provided her and turn my resume an incredible job search tool which has gotten me noticed and contacted. 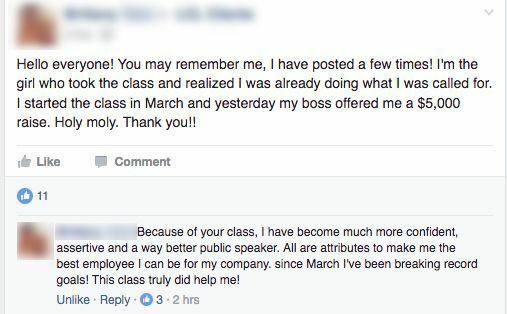 “I came across her webinar via Facebook. By the end, I knew I had sign up. 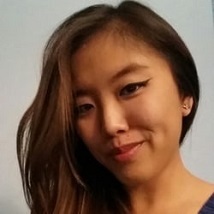 I went slowly through the modules and then I was laid off, so there was a huge motivating factor for me to embrace everything as much as I could and bring it to life in my job search. From the first day of my layoff until I signed a job offer, I had interviews on a weekly basis, except for one week I took a vacation. There were so many options. My friends kept asking me how I got that many interviews. I made it to several final round interviews and with two different organizations, I interviewed for one position but the interviewees found that they wanted me for even higher level positions. The job I currently have, is a temporary gig only so they could slot me into a position that my boss and I are creating now. It is amazing at how I ended up here. 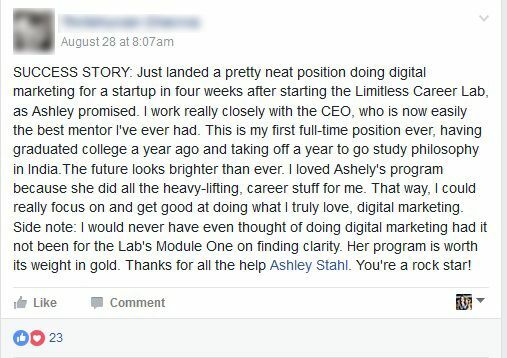 The energy that Ashley brings is so powerful and she really does have a passion for my success (and everyone else). She says so many things that resonates with my belief system and I respond well to people who are truly genuine and nice. 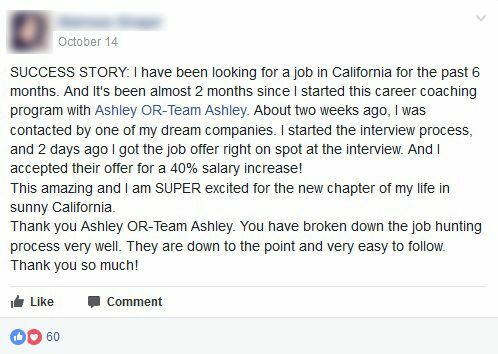 When I saw that people who never worked with Ashley reviewed her based off a free webinar, I felt hurt by what they had to say because she is so amazing and I really think they are missing out not being able to see Ashley’s positive light and skills but people view their world through their own lens. And so, maybe that is why the Facebook client group is filled warmth and kindness because not one person speaks negatively of others and we all have a mutual respect for each other. What I found to be a highlight, is the Facebook group. Imagine being in a group of hundreds of people cheering you on, who share stories that we can all learn from. If you thrive in very positive supportive respectful environments (it is not a space for bullies) then this is the best place for you and your career path. 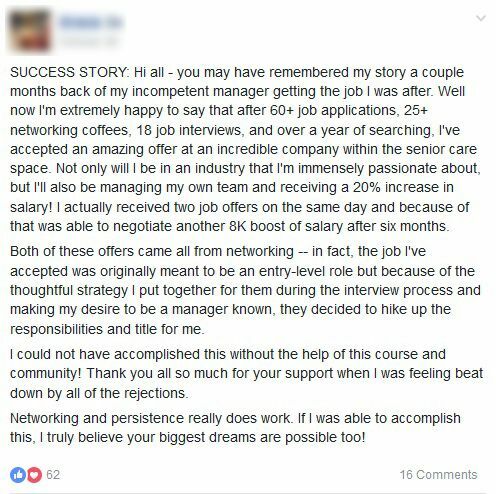 You are not alone and you will never feel stuck in your career ever again. I am beyond grateful for Ashley and I will continue to watch her career grow. I will always support her any way I can because I cannot repay her for everything she has helped me with. She is a true inspiration and I hope that myself and others who have worked with her can convey she is worth the investment. Because if you spend money to work in a career you love and make more money that you did before, it is a small investment overall and the program will probably end up paying for itself like it has for so many people. “AMAZING! Ashley’s program is the best program there is. 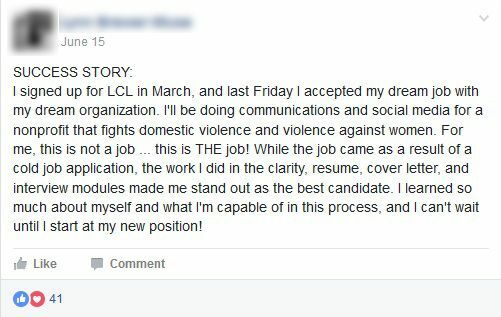 Her approach is innovative and challenges the typical job search techniques. Well worth the small financial and time investment! I was able to go from being unemployed to negotiating a salary $14,000 more annually than I was making at my previous job in just 2 months of the program. 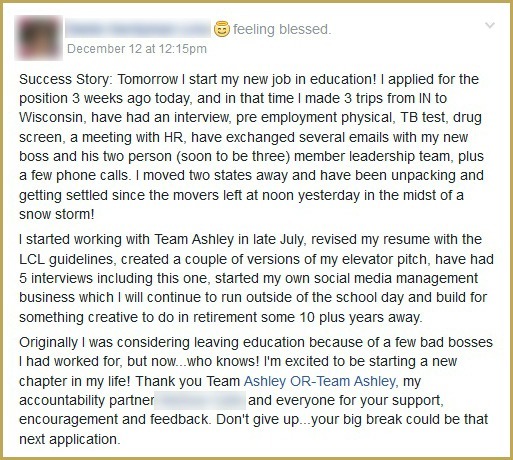 Before participating in Ashley’s course I was unemployed, depressed and feeling like my college degree was worthless. After completing her course and beginning my new job I feel confident, like I am being paid what I am worth and like I have an abundance of opportunities! 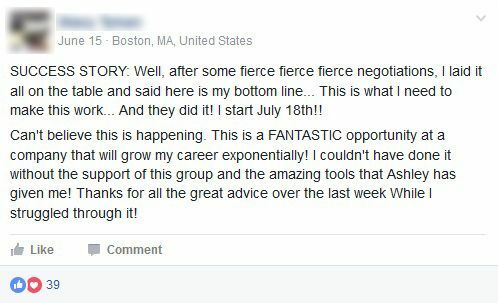 If you follow her plan closely and utilize the online Facebook group, you WILL see results. *Disclaimer: These results are not typical. Your results may vary. Our average customer receives an increase in responses to their resume. “I had the pleasure of meeting Ashley a few months ago. She spoke to our Lean In Los Angeles group. A group of goal oriented professional women. 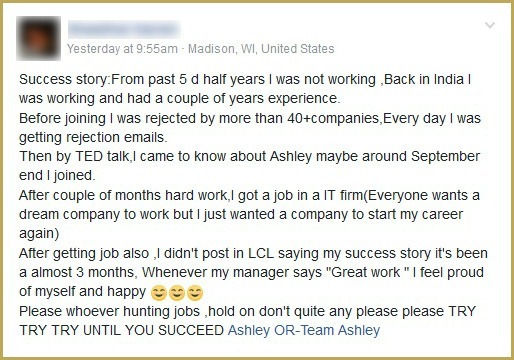 I was motivated in many ways by Ashley’s words. She touch on the topic of networking. Giving us various examples of how to network efficiently to get more than just a contact or lead. 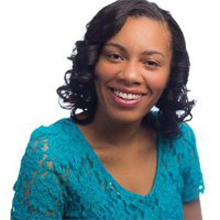 Ashley will give you the tools to strengthen your network and get where you need to go. After hearing Ashley talk to our group I instantly subscribe to her newsletter. 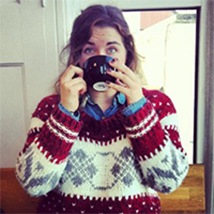 In her newsletter she touches on plenty of other professional topics. I can honestly say her newsletter keeps me motivated. Personally I am in a transition, looking for the right career move as a female entrepreneur. Ashley taught me how to become clear in what I am good at and look for my true passion or gift. 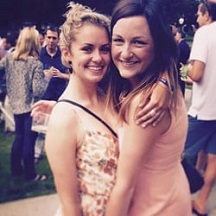 “I first started working with Ashley back in September 2013 when I was feeling lost and very unhappy in my job. My whole life I thought I would work in fashion but I was unsatisfied with every job I took in the industry. This presented a problem because I had no idea what else I could do with my career. 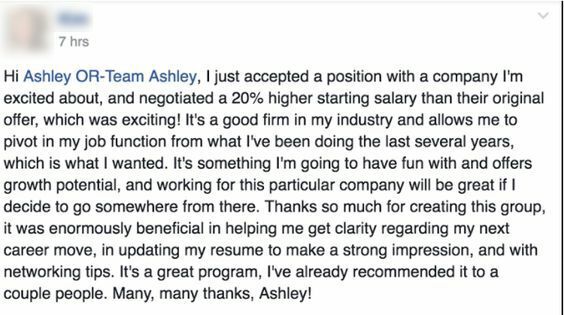 When I came to Ashley, she worked with me to figure out how to transition into a different career. Her words are ingrained in my brain- “Do what you are…not what you love.” At first this statement confused me but Ashley explained that I was pursuing a career based on one of my hobbies and my creativity was being stifled because I wasn’t able to enjoy fashion anymore. Then together we explored the innate qualities that make me shine. This was Ashley’s way of helping me see what I AM. I am a person who has always helped my friends and family with emotional problems and I have an intense curiosity about people and why they think the way they think. This was the best gift I got from my whole experience working with Ashley. She helped direct my attention inward and rebooted my confidence in myself. A month into working with Ashley, I took my GRE, started taking classes, and I am now pursuing a master’s degree in Psychology. 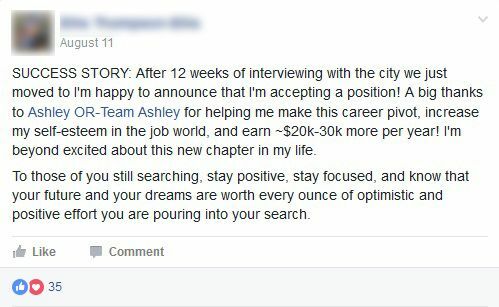 I am so grateful for Ashley’s guiding advice and wisdom because I now feel so much more confident my future. 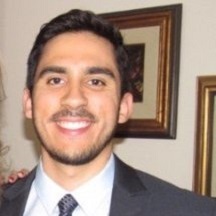 “Through the modules and the team’s feedback I made significant improvements to my LinkedIn profile and resume. You’re given highly effective tactics to help in your interview and salary negotiation process. If you have any questions, the team responds with concise, valuable and helpful feedback in a very timely fashion. The entire program is meticulously organized, but above all, I felt that you and your team really care about helping people find amazing jobs that they deserve. There is no doubt in my mind about that. 1. Customer service is exceptional. 2. If you devote time and really work on the methodology that this program proposes, it is impossible for somebody to not be successful. It very subtly opens your eyes to how the world works. 3. Patience is important, if you expect that you will join the program and you will get the results immediately, then this is not the program for you. Everybody’s situation is unique and some people get results faster than others. 4. There is also a Facebook group which connects different people in the program and even if you are just a reader, you will learn a lot from people’s experience. 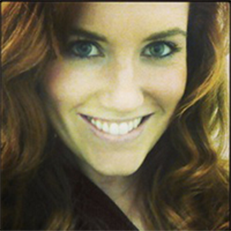 “I am so grateful for Ashley’s knowledge and experience. I felt like typical confused millennial college grad stuck in a chronic state of stressful underemployment. 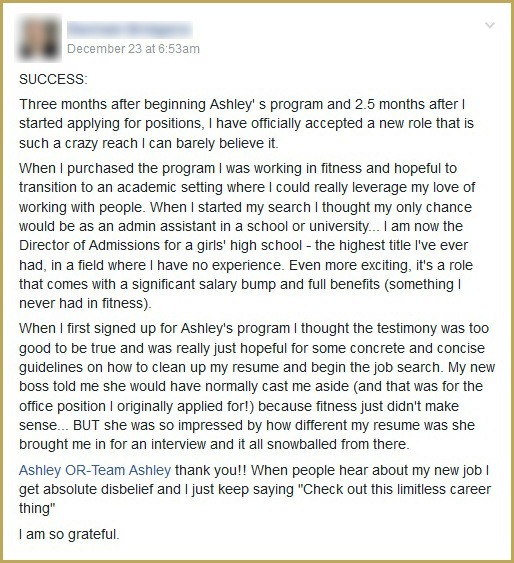 Ashley helped my turnmyself into a focused professional with joy and balance in my life. The confidence I gained from working with Ashley is real and priceless. During our sessions wehammered out plans for cold networking with anyone I wanted a phone call or meeting with by strategically using LinkedIn and other networking tools. 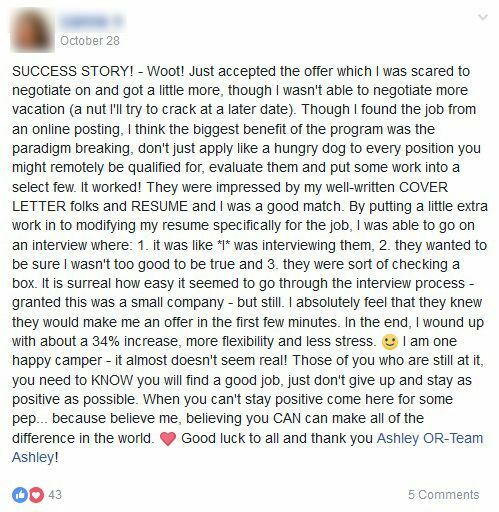 I also formed a beautiful answer to thequestion “So tell me about yourself?” and was supported by Ashley to powerfully negotiate mysalary and employment package. Her sessions create meaningful change in your life by helping you raise your standards and identify opportunities to change the way that you think about your future. I no longer have skewed perception of money and the value of my work. 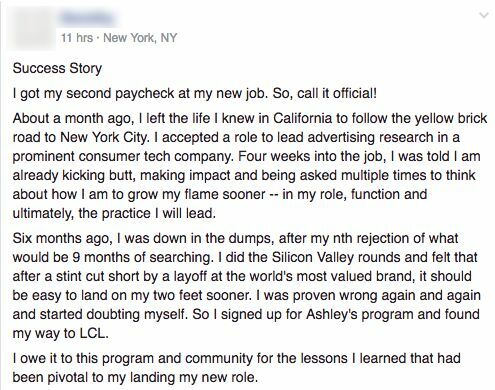 “I was referred to Ashley for career advice. I had experience working with a life coach before and based my expectation of career coaching on that. Ashley far exceeded what I was hoping for, her one on one sessions propelled me into taking actions that would have taken months to accomplish otherwise. 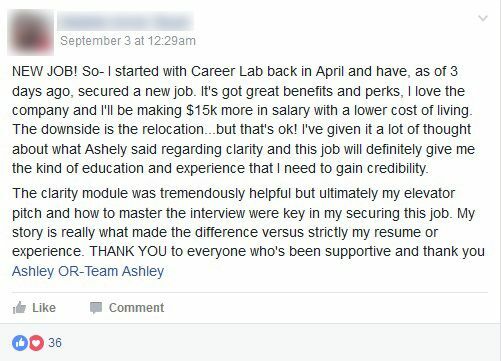 Ashley’s ability to use her personal experience, her natural networking skills along with the wealth of knowledge and toolkit were so helpful in finding a meaningful job. 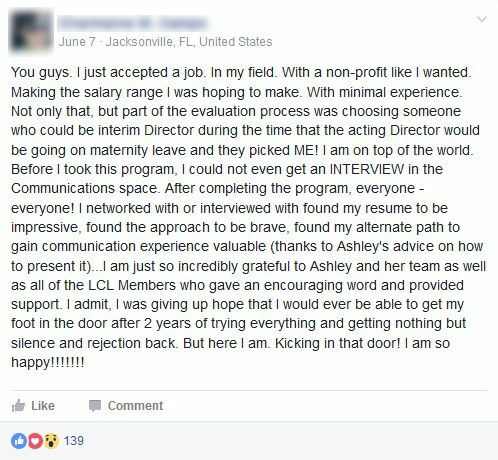 I had about 6 sessions with Ashley and about a month after the last I was offered a job that aligned with the values I identified in our sessions. 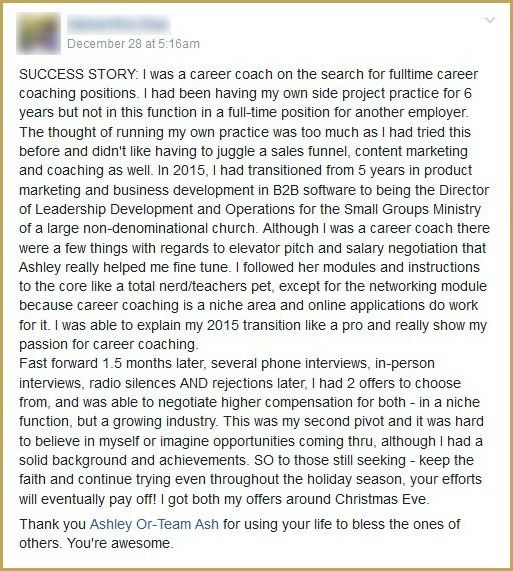 Ashley introduced me to someone in her inner network, who helped refer me to the company and get my foot in the door. 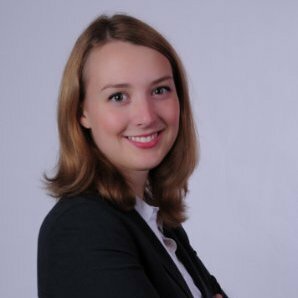 “After being abruptly evacuated from my Peace Corps service in Ukraine, I found myself feeling lost and suddenly out of a job. My life was flipped on its head almost over night. 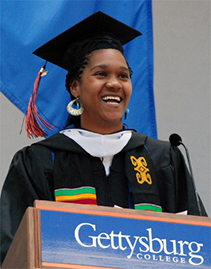 I felt unsure about what I wanted to do and what I had to offer as a “sort of” Returned Peace Corps Volunteer and recent college grad. For a few months, while living at home, I had considered going to find a job in DC (my background is in International Affairs), though after my evacuation from Ukraine I wasn’t exactly in the mood to take big risks. 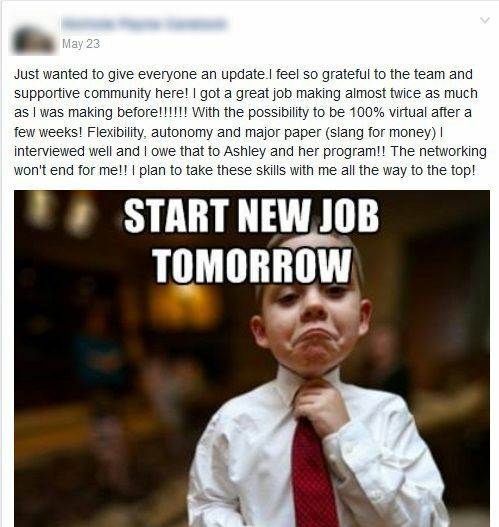 I found out about Ashley from a friend who had recently received career counseling herself, and highly recommended I talk with her regarding my career goals and aspirations. After our meetings going out to DC no longer felt like such a risk. I had a much better idea of what I wanted to do and confidence in what I had to offer, as well as the necessary tangible skills to pursue my goals. Although there were no guarantees, I went out to DC and employed the ideas given to me from Ashley. Remembering her words of wisdom I networked like crazy and made real, mutually-beneficial connections with people. One of the connections ultimately resulted in a job; today, I’m working for a government contractor as a content manager. Ashley is quick to deflect any responsibility for my achievements, though I can say with confidence that if it wasn’t for this amazing individual I would not be where I am today. “Working closely with Ashley has been a dream. I, like many millennials was lost, stuck in acareer rut and needed guidance. Ashley came into my life exactly when I needed her. She hastaught me to let go, to unplug and to trust myself. My confidence level in the past fewmonths has grown immensely. Knowing that Ashley has complete faith in me has truly helpedme to have faith in myself. I know that with the tools Ashley has given me I can achievewhatever I set my mind to; I’m confident in my ability to stand out in my field of choice andI know that through our sessions Ashley has opened me up to a whole new world ofpossibilities. I can say, without a doubt that Ashley was born to be a coach. She is engaging,present, extremely supportive, and has the innate ability to help people see the real person inside. I am very lucky to have been able to work with Ashley, but I am extremely grateful to have met her. “Ashley Stahl is a gift. It was clear in every aspect of our communication — from our consultation to our final session that she is a person genuinely invested in delivering her clients results both personally and professionally. She walks you through every element of the process — the elevator pitch, the resume, the networking, the negotiation — so you feel confident and comfortable taking strategic and decisive action even after the session is over. Undoubtedly, one of Ashley’s most powerful attributes is that she leads by example. 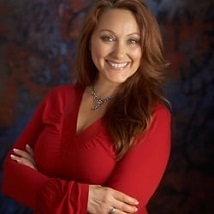 When she speaks to you on a subject or topic — whether entrepreneurship, negotiation, branding, or networking — she speaks with confidence and competence not only because she has experience with these areas from her own career but also because she is continuously acquiring new best practices, techniques, skills to assist her clients. 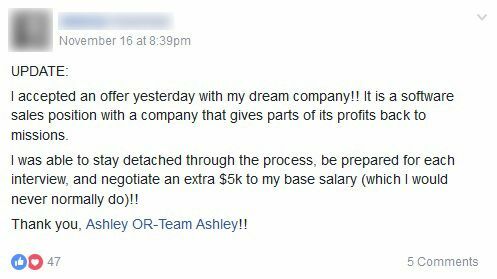 Ashley values being of service and this was crystal clear in all our interactions. I am so grateful for Ashley. She has transformed my view on my professional future because now I am equipped with the tools to be take big action, and receive big results. 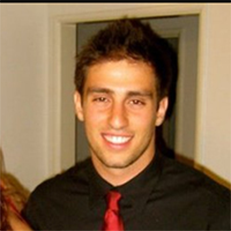 “I only have great things to say about my experience with Ashley. Before we met I felt like Ihad so much to say to people, but I didn’t know whom to say it to or even how to say it. Ididn’t even know what questions I should have been asking myself! I was drowning mysorrows with pints of ice cream and watching Netflix all day because I didn’t know how tofigure out what I wanted. I was so focused on how to do what I was passionate about, butwas confused on how that could translate into a career. 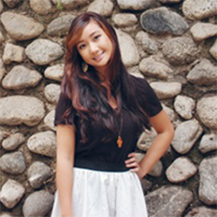 “During my time working with Ashley, I found her to be passionate about helping millennials. I contacted her for a consultation after I listened to her TED talk. I was feeling frustrated, and trapped professionally. She helped me to organize my thoughts, and decide a few paths I could pursue in the future. The sessions were very professional and she was extremely detailed. I was impressed that she also made a great effort to personally know me. She is particularly attuned to career problems (real or perceived) and worked diligently to walk me through the decision-making process. Her primary concern – that every millennial find their niche, present themselves in a professional manner, and negotiate – was well-served with every interaction she had with me. 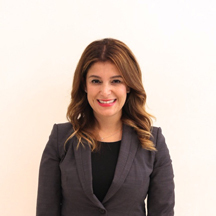 “Ashley spends her time out of her already busy and demanding schedule to make sure her clients have the knowledge to reach a place where most have lost hope in… achieving happiness. 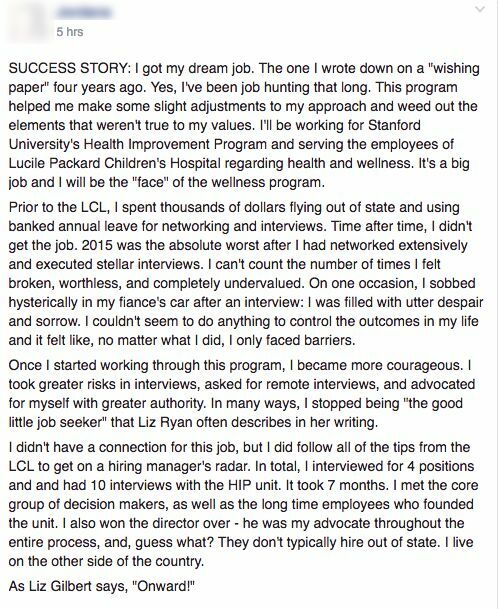 She helps us see that there is a better path to that job that you thought would take a miracle to reach. You will not be sorry if you decide to turn to her for help. 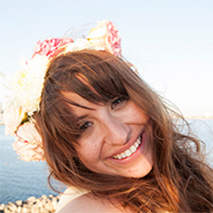 “Ashley is effervescent, charismatic, and extremely observant. Our sessions are not only filled with constructive conversation and information but extremely enjoyable. I was feeling stuck at my current job. Although we are still in the midst of our sessions, she has given me the tools and techniques I need to feel more confident and get where I need to be.